Below are common attributes associated to Milky Way Cast Iron Plant. Become a care taker for Milky Way Cast Iron Plant! Below are member comments regarding how to plant Milky Way Cast Iron Plant. No comments have been posted regarding how to plant Milky Way Cast Iron Plant. Be the first! Do you know how to plant Milky Way Cast Iron Plant? Below are member comments regarding how to prune Milky Way Cast Iron Plant. No comments have been posted regarding how to prune Milky Way Cast Iron Plant. Be the first! 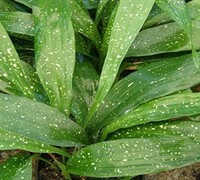 Do you know how to prune Milky Way Cast Iron Plant? Below are member comments regarding how to fertilize Milky Way Cast Iron Plant. No comments have been posted regarding how to fertilize Milky Way Cast Iron Plant. Be the first! Do you know how to fertlize and water Milky Way Cast Iron Plant? Below are member comments regarding how to deal with Milky Way Cast Iron Plant's pests and problems. No comments have been posted regarding how to deal with Milky Way Cast Iron Plant's pests and problems. Be the first! Do you know how to deal with pests and problems with Milky Way Cast Iron Plant? Looking for Milky Way Cast Iron Plant? feed Cast Iron Plant one time a year, in spring, with a well-balanced plant food containing a micronutrient package including iron and/or sulphur. This helps the foliage to maintain its very dark green color.